Hi! Terribly sorry to have been gone for such a long time. I have missed writing, but I needed to concentrate on my homework for some time. I don’t know yet if I will be back for good just yet, but I will try. I have checked the voting, and it seems that a lot of my readers would like me to write about Eminem, and some also about Linkin Park, and I got a comment stuffed with suggestions for other artists and songs to write about. I will do so, but since it’s my first day back, I thought I should write about a song that means a bit more to me, just to get back in the game. With that said, I haven’t closed the poll yet, so you can still go and vote for artists, the ones that are in there from before, or suggest new ones, and I will check it out. I have also discovered some new music that I can’t wait to share with you, so I really hope I get the time to write more. I know I haven’t blogged in a really, REALLY long time, and I’m sorry! I have had so much homework, and I still do, so you would have to wait some more before something new gets posted. He has a great music taste (okay, it’s a bit similar to mine, so of course I would say that, haha), and writes well. 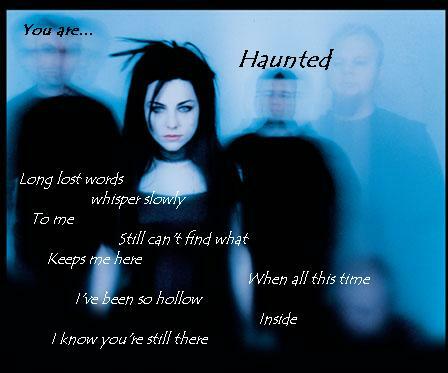 His last post was on the song “Haunted” by Evanescence, really good! I have thought long about if this blog has enough variety in songs. That is why I created this poll below, in which I ask for suggestions for artists to write a post about. Well, it wouldn’t be about the artist, but a song by the artist. (If you want info on the artist, use Wikipedia, for God’s sake!) You may submit your own answers to this poll, if you’d like. I have just come up with some examples, that I actually may consider writing about if you want me to. You may also select several of the alternatives, just to have it said.